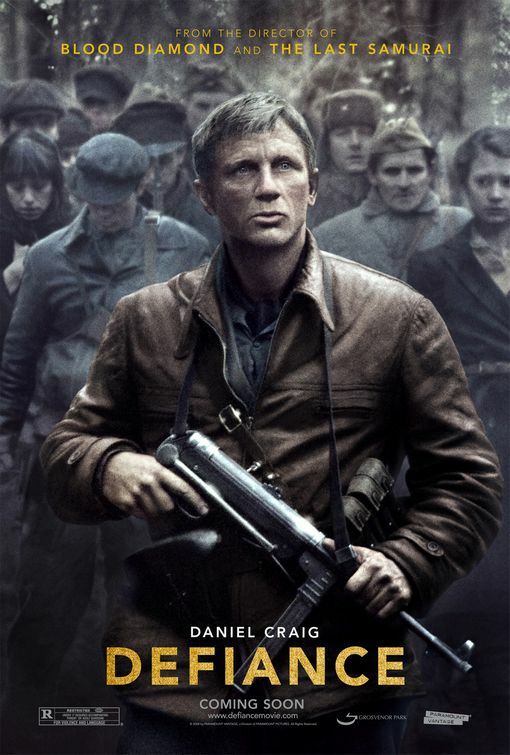 The movie is based Nechama Tec’s 1993 book, Defiance: The Bielski Partisans. An additional work, 2003’s The Bielski Brothers: The True Story of Three Men Who Defied the Nazis, Built a Village in the Forest, and Saved 1,200 Jews was written by Peter Duffy. Duffy’s book did much to bring the heroism of the Bielski brothers to the wider audience that they so rightly deserve. Tuvia Bielski (1906-1987) was the leader of the partisan group known as the Bielski Partisans. The group was situated in the Naliboki forest in the border area between Belarus and Poland. The Bielski group rescued Jews from the ghettos and brought them to a forest sanctuary where they created a society based on surviving the war, fighting the Nazis and preserving the Jewish way of life. And they succeeded. There was simply no other similar group during the Holocaust that had such success. The Bielski Brothers’ story is worth telling—they fought back, saved other Jews, survived and sought revenge. Their story should become one of the stories that people think of when they recall the Holocaust. Defiance offers an opportunity to correct the history of the Holocaust by remembering the contributions made by the Zionist leader Ze’ev Jabotinsky and his Betar student movement. Jabotinsky molded and commanded Betar from its inception in 1923 through his death in 1940. The political enemies of Jabotinsky and his movement have worked since the 1930s to delegitimize them. First lies and slander were hurled at them. Later the Leftists made every effort to write them out of history, so their views, and the views of their ideological heirs, would seem less valid. The Jabotinsky Zionists introduced an authentically Jewish worldview to Zionism. Many of the fighting heroes of the Holocaust embraced the new ideology. Peter Duffy writes that Zus Bielski attended Betar meetings before the war. The man the Bielskis entrusted with the role of chief of staff of their partisan group was a former Polish army officer and Betar veteran named Layzer Malbin. Malbin and Zus commanded the fighting units while Tuvia ran the camp and made political decisions. In Defiance, Malbin is played by Mark Feuerstein who is perhaps best known for the NBC sitcom Good Morning, Miami. There are other well-known Betar trained men who fought the Nazis and led underground fighters during the war, and these heroes must be remembered too. The most famous Jewish leader of armed resistance was Mordechai Anielwicz, commander of the ZOB (Jewish Fighting Organization) during the 1943 Warsaw Ghetto Uprising. Anielwicz received paramilitary training in Betar as a young teenager and left Betar before the war. The ZOB had a socialist orientation and Betar as an organization did not participate in it. The Jewish Military Organization, (ZZW) was the other armed resistance group in the Warsaw ghetto uprising. The ZZW was led and manned by Betar members and their allies. Betar’s fighters in the Warsaw ghetto uprising were largely written out of history by the Left. Moshe Arens, Israel’s former defense minister and a Betar alum, recently wrote a yet to be published book on Betar’s heroic battle against the S.S. in the ghetto. Articles by Arens about the ZZW were published in Yad Vashem Studies, Haaretz, and The Jerusalem Post and have helped to create a far more accurate account of the ZZW’s participation in the uprising. Defiance offers an opportunity to remind today’s Jews about Jabotinsky’s vital contribution to Jewish thought. His words and ideas animated a generation to resist the Nazis and fight for the freedom of Israel. The Islamofascists and Iranians are focused on destroying Israel and the Jewish People in a future Holocaust more intense than the original. Jabotinsky needs to be remembered. Moshe Phillips is a member of the Executive Committee of the Philadelphia Chapter of Americans For a Safe Israel, AFSI (www.phillyafsi.com). Moshe’s blog can be found at http://phillyafsi.blogtownhall.com. Country squires in fur coats and farmers in rags, all lumped together. And all ages from confused old men to frightened children. And alone, in groups, or in lines; from trees, from telegraph poles, or the gallows. Some with their caps and hats on their heads. And also two women; both young and pretty. And the spectators, often posing for photos. A soldier who appears to be amused stands over the body of a Ukrainian priest. Nazi criminals? You have to ask! Anton Holzer’s collection of photographs speaks volumes. And will shock; for the facts are not yet known in the wider world. It’s a photographic story that demonstrates that the old Austrian K.u.K. Army in the Balkans, in Poland and in Russia was not very much better than the German Wehrmacht in World War II with its contribution to the Holocaust. In Serbia, Bosnia and Croatia, along the Adriatic and in Galicia not thousands but tens of thousands of innocent civilians, the vast majority without any legal process and only because of hysterical outbursts from K.u.K. officers who thought every civilian was a spy, were summarily executed. The worst affected were the Ukrainians and the Jews. In East Galicia every constable, watchman, sergeant, had the power to order that every alleged spy, every arbitrary suspect, could be hanged without any formalities. The newspapers carried photos of arrests and public executions; Russian Spy Arrested, Farmer is Suspected Spy, Suspicious Female Spy Captured, German Gendarme with a Jewish Spy, were typical captions. The public hangings were photographed and went on sale as postcards. The fear of spies had to be widely spread. Training courses for potential hangmen were available. The K.u.K. army was ordered to spread terror: In Serbian border towns and villages take hostages. In the event of any incidents and to justify hostages burn down the place, to paraphrase an instruction to military commanders dated 12th August 1914. The first massacre of Serbian civilians took place in the third week of the war. At an execution of a prominent prisoner a photograph was taken of Vienna’s laughing hangman, Josef Lang, who was brought in for the occasion; dressed in bow-tie and bowler hat Lang stands smiling over the corpse of Cesare Battisti. He is surrounded by a laughing crowd of civilians and soldiers. Battisti, a former K.u.K. politician was an Italian patriot and had therefore joined the Italian Army. When he was captured by the Austrians, he was imprisoned, charged with betrayal and hanged in public. In Sabac on 18th August 1914 Field Marshal Lieutenant Kasimir von Lütgendorf ordered three of his own soldiers to be executed for being drunk. The bloody execution, carried out with bayonets, took place in the square directly outside the town’s church. In 1920 Lütgendorf was sentenced to 6 months military detention but without loss of rank or military honours. Anton Holzer’s book Das Lächeln der Henker – Der unbekannte Krieg gegen die Zivilbevölkerung 1914-1918* (Primus Verlag) will not be widely read in Austria says reviewer Hellmut Butterweck in the Wiener Zeitung newspaper dated 12th December 2008. This theme is an indigestible morsel for Austrian self-image, he concludes. *The Smile of the Hangman – the unknown war against the civil population 1914-1918. Friends and Brothers! Bolshevism is the enemy of the Russian people. It has brought countless disasters to our country. Enough blood has been spilled! There has been enough starvation, forced labour and suffering in the Bolshevik torture chambers! Arise and join in the struggle for freedom! Long may peace with honour with Germany prevail! These murderous experiments were part of a programme of ethnic cleansing and ‘counter-insurgency’ in the East that led to the deaths of millions of Jews, Soviet prisoners of war, captured Communists, partisans and ordinary people caught in the crossfire of ideological and racial war – a harvest of dead unparalleled in the history of modern war. Few of those who witnessed German tanks rolling past their villages in the early days of the invasion knew what to expect of the invader. In the Baltic states, Belorussia and the Ukraine there was strong hostility to Stalin and Stalinism, but alienation from Soviet rule did not necessarily mean that German rule would be any more welcome. Even collaboration with the invader, with the usual implication of betrayal and opportunism, should not always be taken at face value. There is no doubt that some of those who found themselves under German control in the East did work with the invader. Some did so voluntarily, spurred on by a genuine loathing of Soviet Communism. Some did so in the mistaken belief that the Germans had enlightened views on the restoration of private land ownership and capitalist enterprise. (In Kiev a number of Jewish merchants even petitioned the German authorities for permission to restart their businesses. )2 Some did so because they saw an opportunity to set up independent national states long denied them by Soviet repression. National committees were formed in the Baltic states, in the Ukraine and in the Caucasus area. The largest number of collaborators were to be found helping the German armed forces. The recruitment of Soviet military labour began not long after the invasion. Soviet prisoners or local labourers were used as auxiliary volunteers. They performed mainly menial jobs – building defences, hauling supplies or building airfields and camps. They were employed in secret at first, for Hitler had expressly forbidden the use of Soviet labour. Rather than use their labour power for the war effort, the Germans left millions of prisoners of war in huge open camps to die of malnutrition and disease.3 But German commanders in Russia soon found they had no choice but to recruit local labour. The vast area of the front and the speed of the advance made it impossible to supply enough German hands to run the whole military apparatus that backed up the front line. By the end of the summer of 1943 Soviet recruits were to be found in the ranks of the fighting force itself, mobilized for the crusade against Bolshevism. The man the Kaminsky outlaws were going to serve was General Andrei Vlasov, who only three years before had distinguished himself in the defence of Moscow and was recognized as one of Stalin’s favourites. He was now the head of the Committee for the Liberation of the Peoples of Russia and the nominal leader of those Soviet citizens, more than five million in number, now living under German rule. Vlasov looked the very model of a Prussian general: tall and heavily built, with his hair combed back tightly from a receding hairline and small horn-rimmed spectacles, his appearance was austere and militaristic. He wore no medals or insignia, save a small white, blue and red cockade of the Russian Liberation Army, whose commander he had also now become. He saw himself as the spokesman of a different Russia from Stalin’s, but his appeal was always overshadowed by his decision to pursue that Russia at the side of Hitler. The reaction to Vlasov after 1945 was mixed. In the Soviet Union the official line was to condemn him as a coward and a traitor who deserved rough Communist justice. Vlasov’s supporters saw him as a Russian patriot who tried to steer an impossible course between the two dictators, and his reputation has accordingly been resuscitated since the fall of Soviet Communism. 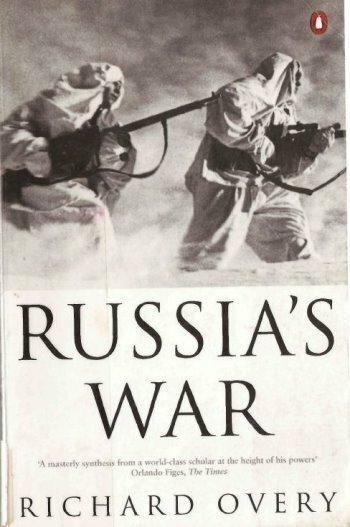 What distinguished Vlasov and the Liberation Army from other Soviet dissidents, however, was their willingness to harness the liberation campaign to the German war effort. Soviet soldiers on the German side shot at ordinary Russians, burned down Russian villages and looted Russian homes. This was more than simple anti-Bolshevism, and it was harder to forgive. Even if Vlasov and his German allies had succeeded in defeating the Red Army and destroying Stalinism, there is little evidence to suggest that Hitler would have allowed an independent, liberal Russian state in place of the vision of harsh empire that drove his conquest on. It was a vision of empire straight out of science fiction. For the conquered peoples it became fact. The native nationalist movements were violently suppressed. In the Ukraine the mood of temporary exhilaration felt at the retreat of the Soviet order evaporated when from the end of August 1941 the Einsatzgruppen, whose job it was to root out anti-German elements, began systematically to round up Ukrainian nationalists and intellectuals, most of whom were executed.18 In the Baltic states, hope of winning back their independence was broken by the creation of a Nazi Commissariat Ostland, placed under the Nazi commissar Hinrich Lohse, and by Hitler’s decision that the Baltic states should eventually be incorporated into the greater German Reich. Lohse was a Nazi ‘old fighter’ from the early days of the movement who used his new power to indulge in a corrupt caricature of imperial rule – requisitioning palaces and a fleet of cars, and living the life of a pampered sybarite until he fled his post in 1944.19 In the Ukraine a second Commissariat was set up in September, a vast sprawling province that at the height of the war embraced fifty million people. Its ruler was another old Nazi comrade, the Gauleiter of East Prussia, Erich Koch. The exact number of Ukrainians who died at the hands of the German occupiers will probably never be known. Death was meted out arbitrarily. Peasants who, when questioned by German officials, admitted to being able to read and write were liable to be shot as ‘intellectuals’. Farmers who withheld food stocks or refused to work the fields for the Germans were hanged as an example to the rest. In the district of Rivne the German farm administrators introduced flogging for everything from slack work to the failure of peasants to remove their caps in the presence of Germans; they imposed curfews; the carrying of a knife was punishable by death.22 Thousands of peasants were hanged or shot for suspected partisan activity. Throughout the Ukraine 250 villages and their populations were deliberately obliterated to encourage good behaviour in the rest. The labour programme was as harsh. In the first weeks of the war Ukrainians volunteered for labour in Germany, but their treatment was so poor that labour quotas had to be imposed and labourers recruited by force. The first volunteers were bundled into boxcars without food and sanitation facilities. When they arrived in Germany they were kept behind barbed wire in rough barracks. Their food was less than the necessary level of nutrition; they were segregated from the rest of the population and forced to wear armbands with the word Ost (East) sewn onto them. When the flow of volunteers dried up, workers were simply seized at gunpoint. Villages that failed to hand over their quota could be torched and their leaders murdered. Churches and cinemas were raided and the people inside shipped off to Germany. Thousands of young Ukrainians fled to the forests and marshes to join the partisans rather than work in captivity. In 1942 Hitler issued a personal order requiring the deporting of half a million Ukrainian women between the ages of eighteen and thirty-five, to be assigned to German households and Germanized. By the end of the war the Ukraine had supplied over four-fifths of all the forced labour from the East.24 The effect of exploitation on this scale was to alienate much of the population in the East as thoroughly from the Germans as from Stalin. Epigraph: C. Andreyev, Vlasov and the Russian Liberation Movement: Soviet Reality and Émigré Theories (Cambridge, 1987), p. 209. 1 M. Burleigh, Death and Deliverance: ‘Euthanasia’ in Germany 1900‐194; (Cambridge, 1994), pp. 230‐31. 2 B. Krawchenko, ‘Soviet Ukraine under Nazi Occupation’, in Y. Boshyk, Ukraine During World War II (Edmonton, 1986), p. 17. 3 A. Dallin, German Rule in Russia (2nd ed., London, 1981); S. Kudryashov, ‘The Hidden Dimension: Wartime Collaboration in the Soviet Union’, in J. Erickson and D. Dilks, eds., Barbarossa: The Axis and the Allies (Edinburgh, T‐994), PP‐ 240‐41. 4 O. Caroe, Soviet Empire: The Turks of Central Asia and Stalinism (London, 1967), pp. 2.47‐8. 5 N. Heller and A. Nekrich, Utopia in Power: The History of the Soviet Union from 1917 to the Present (London, 1985), pp. 428‐9; figures from M. R. Elliott, ‘Soviet Military Collaborators during World War II’, in Boshyk, Ukraine, pp. 92‐6. 6 Elliot, ‘Military Collaborators’, p. 94; S. J. Newland, Cossacks in the German Army, 1941‐1945 (London, 1991), pp. 105‐6, 116‐17; W. Anders, Hitler’s Defeat in Russia (Chicago, 1953), pp. 177‐9. The figure of 250,000 includes some 50,000 who were incorporated into the Cossack Division (15th SS Cossack Cavalry Corps) and other Cossacks recruited into anti‐partisan units, a further twelve reserve regiments and those who served in small numbers in German units, or as non‐combatant auxiliaries. The usual figure given for Cossack combatants is from 20,000 to 25,000 in 1943; the larger figure includes all those who fought for or worked for the Germans at some time between 1941 and 1945. 7 Elliot, ‘Military Collaborators’, p. 93. 8 Kudryashov, ‘Hidden Dimension’, pp. 243‐5; Elliot, ‘Military Collaborators’, pp. 95‐6. 9 Anders, Hitler’s Defeat, p. 191. 10 Details from Andreyev, Vlasov, pp. 19‐29; J. Erickson, The Road to Stalingrad (London, 1976), pp. 352‐3. 11 Andreyev, Vlasov, pp. 38‐40. 13 Ibid., pp. 206‐8, Appendix A, The Smolensk Declaration, 27 December 1942. 14 J. Hoffmann, Die Geschichte der Wlassow‐Armee (Freiburg, 1984), pp. 205‐36. 15 Heller and Nekrich, Utopia, pp. 437‐8; Hoffmann, ‘Wlassow‐Armee, p. 244. 16 Andreyev, Vlasov, pp. 78‐9. N. Rich, Hitler’s War Aims: The Establishment of the New Order (London, 1977), PP‐ 32‐2. Ff. 18 Krawchenko, Soviet Ukraine, pp. 22‐3. 19 Rich, War Aims, pp. 359‐60. 20 I. Kamenetsky, Hitler’s Occupation of Ukraine, 1941‐1944: A Study in Totalitarian Imperialism (Milwaukee, 1956), p. 35. 22 On peasant ‘intellectuals’ see R. Bosworth, Explaining Auschwitz and Hiroshima: History Writing on the Second World War (London, 1993), pp. 149‐51; Krawchenko, ‘Soviet Ukraine’, p. 27; O. Zambinsky, ‘Collaboration of the Population in Occupied Ukrainian Territory: Some Aspects of the Overall Picture’, Journal of Slavic Military Studies 10 (1997), p. 149. 23 Krawchenko, pp. 26‐7; Zambinsky, ‘Collaboration’, p. 148 on Kiev rations; T. P. Mulligan, The Politics of Illusion and Empire: German Occupation Policy in the Soviet Union 1942 ‐1943 (Westport, Conn. 1988), pp. 93 ‐103 for figures on German food supplies from the USSR. Over 10 million tons of grain and almost 2.5 million tons of hay were taken. 24 Out of 2.8 million Ostarbeiter carried off to Germany, 2.3 million came from the Ukraine. See Krawchenko, ‘Soviet Ukraine’, pp. 27‐8; Kamenetsky, Occupation of Ukraine, pp. 46‐8. Atrocities committed by the German military during World War II indiscriminately against men and women, who, particularly in the east, were objectified and dehumanized. For decades historians maintained that the German armed forces during World War II, collectively called the Wehrmacht, were simple soldiers who had the misfortune of fighting for a criminal regime. Historians tended to separate the Wehrmacht from the specialized units that accompanied it into battle such as the SS, the Secret Police (Gestapo), and the infamous police battalions responsible for murdering entire Jewish communities on the eastern front. Soon after the war, memoirs from leading German generals seeking to distance themselves from the Nazi regime flooded the publishing market. U.S. and British historians tended to rely on these accounts and portrayed the Wehrmacht as an honorable institution that was hijacked by a clique of criminals. One of the underlying reasons for this sympathetic portrayal was the cold war. The perceived threat from the Soviet Union necessitated that West Germany become a full partner in the defense of western Europe. Denigrating the Wehrmacht, many of whose generals were needed to rebuild the new German military (now called the Bundeswehr), was counterproductive. There was also a sense that the Nuremburg Trials properly identified and punished those responsible for Nazi Germany’s crimes during the war. Too many historians accepted the notion that the Wehrmacht was not involved in the widespread atrocities committed against civilians and soldiers. For the most part, these atrocities occurred on the eastern front against the Soviet people, specifically Jews. By the mid-1980s historians started to delve further into Wehrmacht activities on the eastern front and quickly learned that regular army units were intimately involved in committing atrocities. The Wehrmacht supported the Nazi regime’s goal of racially reordering Europe and conquering Lebensraum (living space) for Germany in the East. Every organ of the German government was given a role in accomplishing this task, including the Wehrmacht. In 1934 all officers and enlisted men of the Wehrmacht personally swore a loyalty oath to Adolf Hitler. Most did so enthusiastically because they considered Hitler an advocate of military spending and saw a chance to return the military to greatness. The oath bound the Wehrmacht tightly to the Nazi regime and ensured its participation in every phase of Hitler’s plan to destroy European Jewry and dismantle what he called Judeo-Bolshevism in the Soviet Union. Even without the Wehrmacht’s ideological affinity for National Socialism, the German military already had a past record of committing atrocities against civilians during World War I, specifically in Belgium and parts of eastern Europe. Most of the incidents during World War I were isolated, but this was not the case during World War II. Mass executions, population removals, poor treatment of prisoners, and the use of slave labor were Wehrmacht policies handed down from generals to subordinates in an organized fashion. The Wehrmacht prepared for a different sort of war against the Soviet Union years before the conflict began. According to Nazi leadership, the future war against Poland and the Soviet Union was to be one of annihilation. Beginning with the invasion of Poland in September 1939, the Wehrmacht carried with it into battle orders from Hitler to liquidate the Polish intelligentsia so that they would not threaten the German settlement of Polish territory. The Wehrmacht applied broad definitions of who could be considered a partisan and treated large numbers of civilians as legitimate military targets. This definition included Jews, who by virtue of being Jewish were considered automatic threats to the Wehrmacht. Most people identified as partisans were executed, a task shared by the Wehrmacht, the SS, the Gestapo, and police battalions created to occupy territory after the Wehrmacht moved forward. Although many Wehrmacht generals disapproved of their soldiers participating in executions and otherwise enforcing a harsh occupation (mostly for reasons of limited resources), evidence shows that Wehrmacht units were used interchangeably with the SS to execute Jews, Polish clergy, and intellectuals. Once Germany invaded the Soviet Union in July 1941, the Wehrmacht was already experienced at fighting a war of racial annihilation. The Wehrmacht had to guard against disorder in the ranks while still fulfilling its ugly task of killing large numbers of civilians. Letters and films taken by Wehrmacht soldiers at the front reveal that daily life on the eastern front involved treating civilians and enemy soldiers alike as subhumans worthy of extreme treatment. One of the more infamous Wehrmacht policies was to execute a large number of citizens for every Wehrmacht soldier killed by partisans or resistance fighters. This policy applied to all of Germany’s occupied territories, but it was enforced more regularly in the East. For example, if 5 soldiers were killed by partisans, the Wehrmacht might kill 500 civilians from the town where the partisans allegedly lived. Such policies typified the Wehrmacht’s conduct on the eastern front in particular, especially because it regarded the Soviet people, not just the military, as a dangerous enemy. Although the Wehrmacht did not specifically target women when committing atrocities, it had no qualms about executing women and children during reprisals for actions taken against its soldiers. Films taken by Wehrmacht soldiers show soldiers putting nooses around the necks of Russian women accused of spying and attaching signs labeling them “Jewish cows” or other insults. Men and women had different experiences in the ghettos and concentration camps erected by other organs of the National Socialist state, but the Wehrmacht’s atrocities were characterized by their speed, brutality, and indifference to artificialities such as gender. The Wehrmacht viewed entire populations as enemies and treated them accordingly. Bartov, Omer. 1992. “The Conduct of War: Soldiers and the Barbarization of Warfare.” The Journal of Modern History 64:32–45. Forster, Jurgen. 1981. “The Wehrmacht and the War of Extermination against the Soviet Union.” Yad Vashem Studies 14:7–33. Rossino, Alexander B. 2003. Hitler Strikes Poland: Blitzkrieg, Ideology, and Atrocity. Lawrence: University Press of Kansas. People in German-occupied Europe were compelled to work in Germany. Between 1941 and 1945, between 10 and 12 million people were forced to leave their homes and were transported to work in Germany (Stephenson 2001, 121–124). In August 1944, women constituted one-third—1.9 million—of the 5.7 million foreign forced laborers in Germany (Herbert 1997, 296). With its male workforce depleted by conscription and unwilling to compel its own women, who employed many strategies to avoid unpleasant labor, to do industrial or agricultural work, the Nazi regime was dependent on foreign labor. Women from Western Europe were not normally compelled to work in Germany, although many volunteered to do so. This was not the case with Eastern European women, who were forcibly removed to Germany and, after the ordeal of transportation, were subjected to harsh conditions and grinding exploitation. Women from Eastern Europe, predominantly from Soviet territory, constituted 87 percent of foreign female workers in Germany (Herbert 1997, 296). Western European female workers were paid wages, could rent rooms, and were free. Eastern European women, assigned to industry, were housed in barracks and were under police control. If they became pregnant, they might be forced to submit to abortion or were forced to work until delivery and to return to work immediately. Children with supposedly Aryan characteristics were placed in the Lebensborn program to be raised as Germans. Others were warehoused in institutions where they usually perished from neglect and malnutrition. Eastern European women often suffered sexual abuse. Some were forced into prostitution to service the bordellos established for foreign workers. Women workers assigned to agriculture, particularly in southern Germany, often fared better than those in the cities. Herbert, Ulrich. 1997. Hitler’s Foreign Workers: Enforced Foreign Labor in Germany under the Third Reich. Cambridge, England: Cambridge University. Homze, Edward L. 1967. Foreign Labor in Nazi Germany. Princeton, NJ: Princeton University. Stephenson, Jill. 2001. Women in Nazi Germany. Harlow, England: Pearson Education. 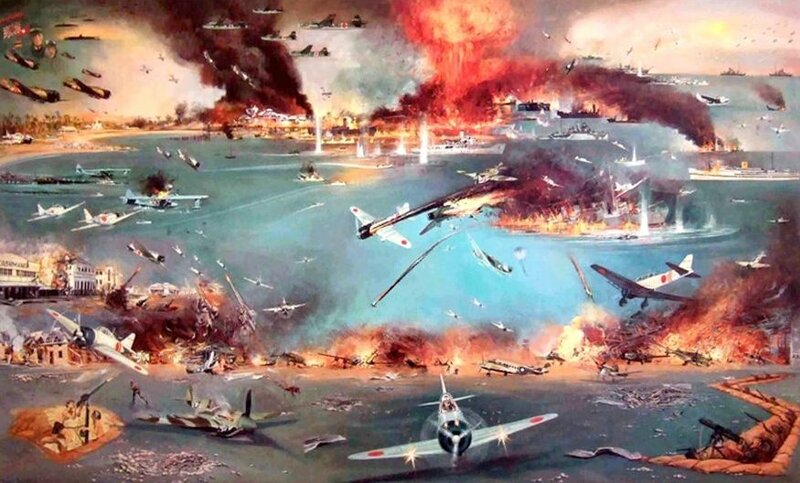 On February 19, 1942, the war-crowded northern Australian harbor of Port Darwin was struck by 198 Japanese bombers. This coordinated land and naval-based air strike surprised the ill-prepared defenders and devastated the port and the shipping concentrated within its harbor. Arriving in two waves, the forty-five minute attack sank eight ships, ran four aground, and severely damaged another eleven. More than 240 people were killed, mostly aboard the ships. Two more ships were destroyed as the planes transited home. They also struck the nearby Royal Australian Air Force (RAAF) base, destroying all the aircraft on the ground and downing all but one of the Australian fighters in the air. A follow-up raid finished off the base and inflicted so much wanton destruction that its military personnel fled to the south in panic. Total Japanese losses were only two aircraft. Darwin and its surrounding area endured more than a dozen air raids over the next fifteen months, but none would be as devastating as this first raid nor even approach its psychological impact. Darwin’s defenses had been neglected during the prewar period, but the most glaring deficiency in the port s defenses was the almost total lack of cooperation among the agencies involved. The resident administrator, Charles Abbott, aloof and ineffectual, had antagonized the local population, including the civil defense and military leaders. Lacking the cooperation of the local population, he had failed to evacuate nonessential personnel, organize the civil defense organization, or establish communications with local military leaders. For their part, the local unions openly thwarted Abbott’s authority, and the civil defense officials blatantly ignored him when he did attempt to organize matters. The local military leaders also made their preparations separately. The Royal Australian Navy (RAN) had established a potentially effective system for protecting shipping offshore and in the port but had not established communications with the RAAF’s warning network. Thus, RAN forces could neither receive early warning of attack nor coordinate their activities with the air force. The RAAF’s only radar set in the area was inoperable on February 19. Moreover, the air force had a policy of withholding air warning until incoming aircraft were indisputably identified as Japanese, which meant that the bombs were practically falling before air-raid alarms could be issued. None of the defense agencies had practiced together or conducted an air-raid drill since the early weeks of December. That left them ill-prepared and confused as the attack developed. Finally, a series of false alarms had worn down local morale, undermined alertness, and led to the RAAF’s tightening its already stringent identification procedures. Darwin had become a target because of its importance as an Allied forward base and logistics center. It was the only significant port in northern Australia and the only one from which the Allies could support their forces in Java and the southwest Pacific. The Imperial Japanese Navy staff had argued that Australia had to be seized, but the army had resisted, indicating that the continent required more troops to subdue and garrison than Japan had to expend. So Australia’s northern ports had to be neutralized instead, and the islands above it had to be seized as a buffer to prevent Allied counterstrokes against Japan’s intended “inner perimeter” of vital islands and resource centers. Destroying Darwin was the first step in that process and offered the additional advantage of diverting Allied resources to Australia’s defense and away from the fighting in Southeast Asia. The air strike was planned and led by the same team, Commanders Genda and Fuchida, that had struck Pearl Harbor in Hawaii some two months earlier, using roughly the same methods and enjoying roughly the same results for roughly the same reasons (but the garrison at Darwin did not have the excuse that defenders had no idea they were at war). As far as the Japanese were concerned, the Allies were slow learners, particularly in light of the quite similar near-obliteration of U.S. air power in the Philippines by the Japanese raid on Clark Air Field. But in the Darwin strike the sea-based air wing was supported by a land-based element operating out of the recently captured airfields in the Dutch East Indies. The carrier-based aircraft would strike first, taking out the port, its shipping, and its defenses. They were escorted by thirty-six Zeros— arguably the best fighter aircraft in the Pacific at that time. The land-based horizontal bombers would then launch the second-phase attack, taking out the airfields and supporting facilities. The Japanese hoped to catch the Allied fighters on the ground, being serviced after the first raid. The plan succeeded beyond their fondest hopes. The carrier aircraft took off at 8:45 A.M. and formed up for their one-hour flight to Darwin. Interestingly, both the carrier- and land-based aircraft were detected and reported by Australian coastwatchers some thirty minutes before they arrived over Darwin (again like the Pearl Harbor raid). Also, the carrier aircraft had struck an Allied convoy north of Darwin the previous day, and its surviving elements had sought refuge in the port. Although the convoy commander expected the Japanese to finish them off in Darwin, he never passed this assessment on to local officials. Instead, he despatched two destroyers and an oiler to refuel east of Darwin, and he placed his crews on alert. Coastwatchers’ reports were ignored pending further verification, and authorities ashore remained unaware of the convoy commander’s assessment. As a result, the raiders arrived unexpectedly and uncontested. The ferocity and effectiveness of the Japanese attack stunned Australian authorities, but in the long run the surprise may have served them better than it did the Japanese (again as at Pearl Harbor), for it energized the Australians into action. No longer were civil defense officials ignored, Air-raid drills began in earnest throughout the country. Nonessential personnel departed Darwin willingly—indeed, enthusiastically (the exodus was sometimes termed “the Darwin Races”)—and a new, more effective administrator was appointed. A royal commission was formed to study what went wrong, and despite the obstruction and outright falsification of records by local authorities, the commission discovered the problems and made some specific recommendations to prevent similar disasters in the future. The local RAAF commander was replaced, the services were forced to establish a common air-defense reporting network, and warning procedures were liberalized to ensure earlier response. Now false alarms were preferable to further surprises. Although the Japanese continued their sporadic attacks against Port Darwin over the next fifteen months, as time went by the raids inflicted significantly less damage and led to higher losses for the Japanese. Connaughton, Richard. Shrouded Secrets (1994). Hall, Timothy. Darwin: Australia’s Darkest Hour (1980). Piekalkiewicz, Janusz. The Air War 1939–1945 (1985).